Cooper-Young is one of Memphis’s diverse neighborhoods with many restaurants and bar options. The neighborhood has been gaining new respect, but it is still bothered by one major problem seen all over Memphis; blight. Sections of S. Cox Street, New York Street, Philadelphia Street and Bruce Street are all plagued by pockets of boarded up houses, overgrown bushes and lawns, broken vehicles and garbage. Though each of the streets has these problems, the 1000 block of Bruce Street is by far the worst. 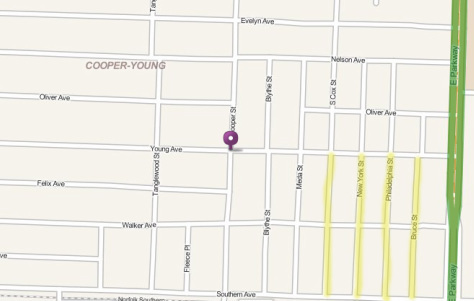 In Cooper-Young, there are four streets that draw particular attention. These four have caused problems for years. "There have been recent attempts to clean up certain streets in the neighborhood, " said Heidi Knochenhauer, Cooper-Young resident since 2003. The bordering neighborhood to the south, Orange Mound, is heavily beset by drugs and crime. There have been numerous drug houses raided and sealed in Orange Mound. In 2009 Police raided 3663 Sharpe Avenue and arrested Ernest Scruggs for selling crack and other illegal drugs out of the house. Despite this, Knochenhauer doesn’t feel like it is a threat to Cooper-Young though. “I have no fear whatsoever”, said Knochenhauer “I love my neighborhood. It’s amazing”. There have been attempts to rid Cooper-Young of the houses that pose as an eyesore to residents and people visiting the neighborhood. In 2001, with help from the CYCA, a few houses were torn down and rebuilt while others were remodeled. People outside of Cooper-Young have also taken an interest in revamping the neighborhood. The Cowles Company focuses on revitalizing urban historic districts and has done work in historic Evergreen, Central Gardens and recently Cooper-Young. The Cowles Company built numerous houses on Elzey Avenue just south of Central Avenue. “The houses sold as quickly as we could build them,” said owner Bernard Cowles. Cowles was pleased with the work done in Cooper-Young and still has more than ten lots to build closer to Cooper Street and the business district. “We definitely plan to do more in the future once the economy gets better,” said Cowles. The former Cooper-Young Development Corporation also tried revitalizing the neighborhood by remodeling and rebuilding homes. Since 1991, more than 60 homes and businesses were redone by the organization. In 2006, CYDC started the Seattle Project on Seattle Street just southwest of Cooper-Young. The Seattle Project was supposed to extricate the deteriorating homes and blight to help make property values go up in Cooper-Young. The CYDC was also working with the Memphis Police Department to eradicate the persistence of drugs dealers in the area. “We tried to replicate the model we had used on New York and Cox streets in the late 1990s and early 2000s. Developing several houses on those streets at the same time worked to our great advantage and helped to turn around the southeast quadrant of the neighborhood,” said Sutton Moria Hayes, former Executive Director of CYDC. Loans were taken out to accomplish the goals of the project, but once the housing market went down, CYDC couldn’t sustain the efforts and were forced to stop the operation. “We had sold three of the nine houses built, and had several interested buyers in those remaining. After the housing market crash, the mortgage products evaporated, and thus so did the buyers,” said Hayes. One house, 1038 Bruce St, sits boarded up in the middle of this Cooper-Young street. The City of Memphis has also gotten involved in Cooper-Young to try and deal with the derelict houses. Two home owners in Cooper-Young are having legal actions taken against them in Mayor AC Wharton's campaign to end blight. The house on 1915 Felix and 1064 Philadelphia St. were included in the lawsuit filed by the city under the Neighborhood Preservation Act. “We have done several sweeps, issued a number of citations and boarded up a number of addresses in Cooper-Young”, said Deputy Director of community enhancement, Onzie Horne. When a house starts to pose a threat to neighbors or is in violation of housing codes, the city can get involved. The owner will be issued citations and will be encouraged to fix up the house. If the owner takes no action, the city can take them to court. The last step is boarding houses up. If a house is abandoned or neglected, as long as every entrance to the house is boarded and no one can get in then the house - it is not in violation of code; regardless of how big of an eyesore to neighbors the house is. Once the boards are put up, the city doesn’t do much and many of the houses boarded up in Cooper-Young are in violation of housing code simply because the boards have either fallen off of windows or people have taken them off to enter the houses. “We are doing all that we can," said Horne. Brett Martin covers Safety for MicroMemphis.